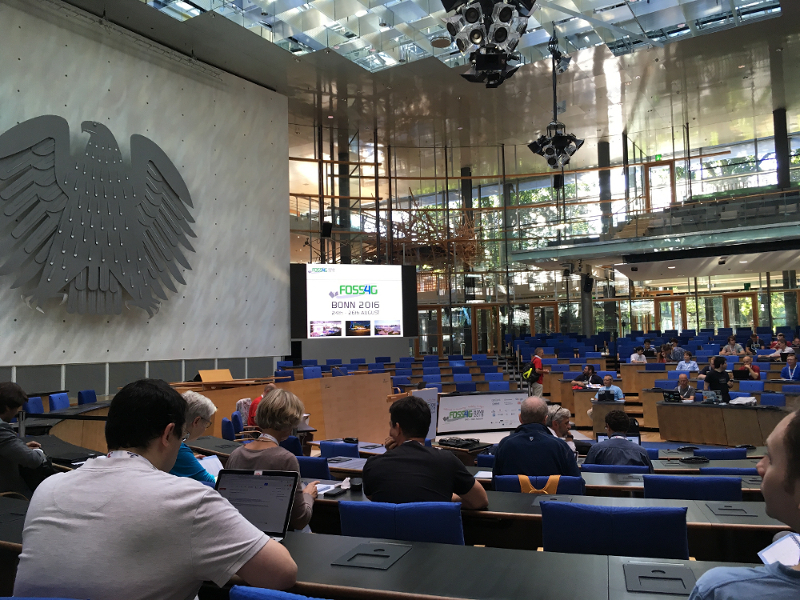 Last week I attended the FOSS4G conference in Bonn. 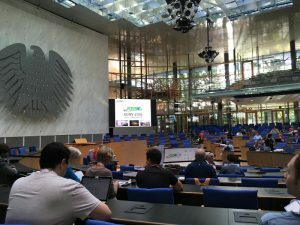 There were plenty of interesting presentations, and the venue (World Conference Center Bonn) was really impressive. If you are interested in our current work on estimation of human exposure to air pollution you can download our presentation slides and watch my presentation (ca. 25 min; mp4, webm). You can also contact us directly for more information. This entry was posted in Project on August 30, 2016 by oliver. This entry was posted in Uncategorized on July 20, 2016 by derek. Until now, we provided Linux versions of the PCRaster software conforming to the Linux Standard Base (LSB). This approach is convenient for users as our executables will run on virtually any Linux distribution. For us developers, however, building LSB software is quite tedious. We were forced to use specific (outdated) compiler versions and we needed to compile and distribute a lot (about 25) of third party libraries ourselves. In addition, the LSB is rather conservative with respect to supporting new compiler versions, therefore not enabling us to use new and very useful features of the C++ programming language. However, we need those new C++ features for our current projects. As PCRaster is open-source for quite some time now there is also no reason to distribute binaries any longer. We will instead focus on improving and extending our software and on distributing the code. We changed our whole build infrastructure to use more libraries installed on the system, and further try to reduce the dependencies to third party libraries making it easier for us to develop and add new features. However, no longer providing binaries will require the Linux users to compile the PCRaster software themselves. Don’t fear; we will provide build scripts that smooth the compilation process. We develop new software due to several research and development projects. Last summer we worked on a multicore module for the PCRaster point operations within the maps4society project. We continue our work on high performance computing elaborating distributed computing to further increase runtime performance of environmental models and parallel I/O. We are also busy with a new file format that is capable of handling heterogeneous data. These exciting projects result in new, volatile software rather than stable versions. But we are convinced that our developments are of interest and useful for adventurous modellers. However, previously it was very difficult to distribute those new software developments to our users. The new release will include an optional flag to build these experimental features such that modellers can benefit from our latest projects more easily. Reducing dependencies to external libraries should result in a straightforward and easier build process for Linux distributions. The PCRaster software will therefore continue to run on all kinds of Linux machines (and yours). We would also like to add the PCRaster software to the OSGeo live CD to streamline the first time experience of new users. In the very near future we also will be able to support other UNIX based systems (the attentive reader might have noticed the operating system used for the screenshot). In a later stage we consider distributing our software via package managers such as apt or macports. This entry was posted in Project, Release on March 1, 2016 by oliver. We are steadily working towards a new version of PCRaster that is better capable of using the current generation of hardware resources. The goal is to make future versions of PCRaster execute models faster. More information about this work can be found on the new High-performance modelling parent project page. This entry was posted in Uncategorized on July 8, 2015 by kor. We are glad to announce the final release of PCRaster-4.1.0! We fixed several bugs in the software and documentation, added support for pickling PCRaster Python types, and changed the location of shared libraries on Windows. For more information please visit the download page. This entry was posted in Uncategorized on April 14, 2015 by kor. We dropped support for Window 32 bit. If 32 bit Windows is still important for you, you can stick with the previous version of PCRaster (4.0.2). Please give this beta a spin if you have the chance. Note that since PCRaster 4, multiple versions of PCRaster can be installed side by side. You never have to uninstall a previous version if you prefer not to. Just install each new version next to the older one(s) and update the PATH and PYTHONPATH environment variables. If things don’t work for you, then please let us know, and revert the environment variables to their previous settings. In case no show-stopper bugs are found, we plan to release the final version of PCRaster-4.1.0 about two weeks from now. This entry was posted in Uncategorized on March 31, 2015 by kor. Merijn de Bakker joined our team as a PhD student. In his project he aims at the development of concepts for a domain specific language for integrated modelling of fields and agents. Ultimately we hope this will lead to a completely new modelling language in which models can be built containing both decision making agents and fields. Merijn will apply his concepts to an air pollution exposure case study in cooperation with our colleagues from the Healthy Urban Living research group at Utrecht University. This entry was posted in Project on March 25, 2015 by derek. 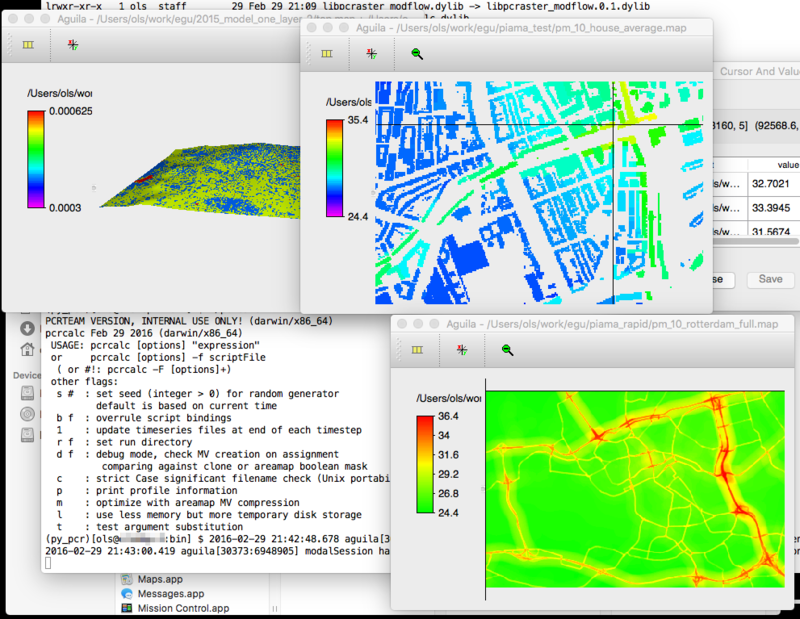 In the context of the Healthy Urban Living programme we implemented a set of Land Use Regression models to determine the spatial distribution of several air pollution concentrations (e.g. NO2, NOx). These models cover the entire Netherlands at 5m resolution (the figure below shows the PM10 concentration). We combine these field-based concentration maps with human activity patterns, for instance to calculate the total exposure of individuals during their home-work travel. For more information join our presentation in the Air Pollution Modelling session next month at the EGU or contact us at info@pcraster.eu. This entry was posted in Project on March 9, 2015 by oliver. We have added e-Lectures to our online courses on dynamic modelling. The lectures provide a short introduction to the material. Subscribe now at the Courses link above to learn how to use our software! This entry was posted in Uncategorized on February 4, 2015 by derek.